Woodworm – not actually worms at all, by the way – are the wood-eating larvae of lots of different species of beetle. These larvae bore small round holes in furniture, beams and flooring as they exit the timber, leaving behind a powdery residue. The woodworm will happily spread from one piece of wood to another, ultimately causing damage – and in some cases, serious structural problems. For this reason, it's vital to get rid of woodworm as soon as you spot the signs. Use our guide to find out how. Discover how to get rid of all types of household pests in our guide. Use all our cleaning tips, hacks and advice for all other housekeeping know-how. New exit holes: look out for these in furniture, beams and flooring; they're particularly likely to appear from May to October when woodworm are active. Don't believe anyone who tells you that the holes are a sign that the woodworm have left. In fact, it's entirely possible that new larvae will be within the wood. Dust around the holes: this might be the first thing you notice. It's not actually dust; nope, this powdery residue we mentioned earlier is droppings, and just looks like fine sawdust. Weak floorboards or beams: this is a sign of a serious woodworm infestation. Larve: they're creamy white in colour and look like little grubs, but are smaller than the tip of a pencil so difficult to spot. Beetles: dead or alive; they are around 3mm long and brownish/black. Why are the woodworm in your home? 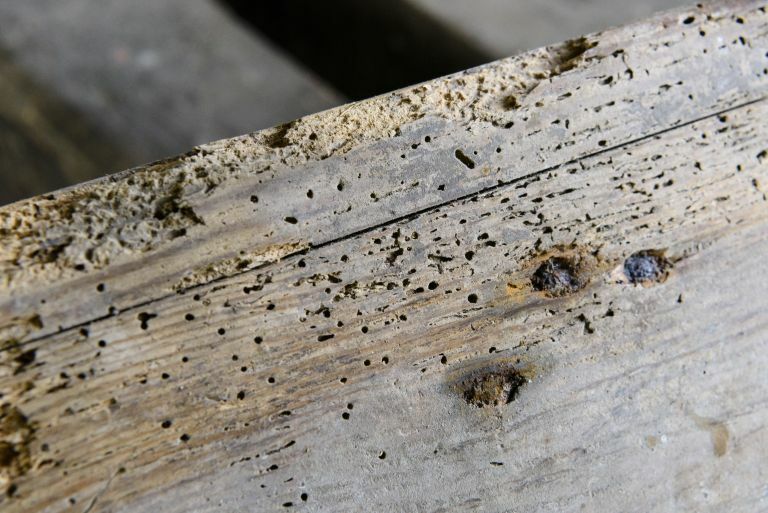 Woodworm may have come into a house on a piece of old furniture or infested timber. Bear this in mind when antique shopping – if there are fresh signs of woodworm in a piece, give it a wide berth. The adult beetles lay eggs on, or just under the surface of, a piece of wood; the larvae then feed on it before pupating and hatching. The cycle is then repeated. The larvae like their timber habitat to have a higher moisture content than is typical, so it's likely, if you discover a woodworm problem in your home, that there is also a problem with excess damp, whether in a poorly ventilated roof or damp cellar. However, damp conditions are not a must. As with any infestation, preventing woodworm is better than treating it. Removing humidity by ensuring rooms are properly heated and ventilated will make your home less attractive to woodworm. If you are worried about the damp in structural timbers and floorboards, you can test its humidity with a timber moisture meter. Any moisture content reading over 20 per cent will need dealing with. If you can pinpoint the woodworm to any newly-bought, single piece of furniture or have spotted an early, isolated infestation, getting rid of the affected piece(s) could prevent or at least minimise any further woodworm invasions in the rest of the house. Treat woodworm yourself or call in professionals? If you are confident that the woodworm infestation is small and limited, perhaps to a piece of furniture, you can try treating it with a good quality, low odour liquid pesticide, following the instructions to the letter. Another option is to put out fly traps in poorly-ventilated rooms; these may catch some of the emerging beetles, but it's a long shot. It's worth knowing that there's no guarantee that DIY methods will work because these types of treatment do not penetrate much past the surface of the wood. They might kill adult beetles as they emerge, but won't reach any larvae inside. And if they don't emerge immediately, they won't be affected by the insecticide you've used – and only repeated treatments will ensure they are. And... the longer your method takes to work, the longer the woodworm have to breed and multiply. If your woodworm infestation is widespread, prolonged or in the structural parts of your property, a thorough chemical treatment by a professional is your best option. It's important to ensure the company you appoint to do the work is qualified. Check they have the correct certifications in place, that they are members of an industry association, such as Property Care Association, and that they are insured for the work they will be doing. Recommendations from friends and family are important, but if you can't get any, you could check online reviews to see how other customers have found them. No online reviews? Ask the company if they can put you in touch with former customers so that you can find out more. Finally, as with any work, get more than one quote in writing, and ensure the quote is a quote and not an estimate. Get in writing what will be involved and how long the work will take, too. The company's response to all these requests will help demonstrate their professionalism, too. If the timbers in your home have been structurally compromised – you'll know this if the wood crumbles or breaks when you touch it – it's worth getting professional advice about whether it will be more cost effective to cut away and replace the damaged parts, or better to remove and replace them in their entirety. Bear in mind that a woodworm infestation doesn't necessarily mean that timbers will be structurally affected, since woodworm usually only infect the upper layer of wood. Caught early, you may find that the repairs are not as drastic as you might first have feared. Find out more about maintaining old timber frame buildings.